Back by popular demand, the Matchbook workshops are designed to delve deeper into popular subject areas and disciplines. We emphasise on high-levels of audience interaction and hands-on activities to deliver a more comprehensive learning experience. Our upcoming workshop will be lead by leading performance & psychology coach, Steve Ward covering Sports Betting to Win : Practical Strategies for Enhanced Decision Making, Discipline and Performance. In this seminar, leading trading performance and psychology coach Steve Ward, will provide practical tips and strategies drawn from performance psychology, neuroscience, decision science, stress physiology and mindfulness based approaches to help you enhance your decision making process, strengthen your discipline and improve your betting performance. This takes place on Monday, March 14th between 6-9pm in the stunning setting of the Crystal Ballroom of the St. Ermin’s Hotel (Caxton St, London SW1H 0QW – 2 mins from St James Palace Tube station). This is a unique opportunity to work with Steve and learn how to take the lessons from his book and apply them to your trading strategies and routine. And best of all we have 2 free tickets to this event to giveaway here at Bet72. Just email info@bet72.com with your Matchbook username (if you don’t have one just click here & you can grab a free £20 bet too) before 7pm on Sunday 13th March and we will draw 2 lucky winners at random. Or if you want to secure a place now we have a handful of tickets remaining at an exclusive discount. If you use promo code: traders25off you will receive an exclusive £25 discount to the event, reducing the ticket price to £45 plus the evening includes dinner and drinks too! And don’t forget if you want to get in the draw for one, email us your Matchbook username and good luck! It would seem just about every bookmaker out there at the moment wants to give you a little extra & Matchbook are no different. What’s more with just a very nice low 1% commission on all winning bets, growing liquidity and the range of their markets too, they are becoming a serious player in the betting exchange arena. Simply place your bet on Arsenal at the current back odds. If the bet wins we will top up your odds with bonus funds to the value of 5/1 (6.0). Maximum stake for this offer is £10. Offer applies to pre-game bets only. This offer is eligible to new customers. At the time of typing Arsenal were 1.5 to lay on Betfair meaning you can lock in a very tasty £29+ guaranteed risk free profit whatever the outcome using the maximum initial £10 stake. 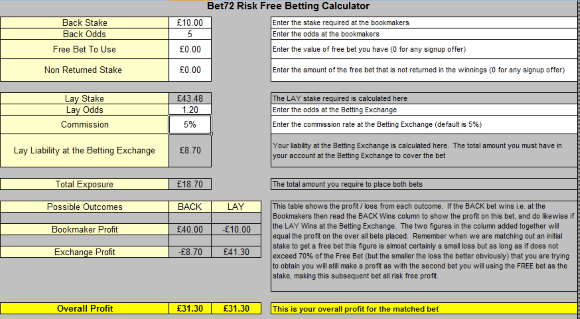 Here is our spreadsheet showing the 6.0 back price with Matchbook against the 1.5 lay price on Betfair and the £29.31 profit from just this single bet. 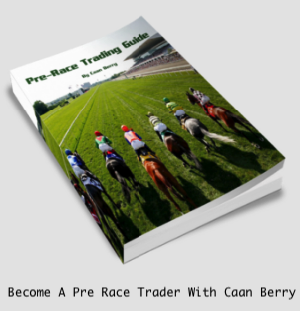 So a guaranteed risk free profit,for a few minutes clicking…. We think the words No and Brainer spring to mind. And remember not only are you getting a great sign up offer here but also a 1% betting exchange account to use in the future. So this will allow you to squeeze even more profit from all your other offers to! So all that is left to say is, click below to grab the price boost of the season so far…. This offer is only available to new Matchbook customers who place their first bet on Arsenal v. Newcastle (12/12/2014). Offer applies to pre-game bets only. Arsenal v. Newcastle (13/12/2014) at their current price and Matchbook will give you odds of 6.0 within 72 hours if Arsenal win. Maximum stake for this offer is £10. Bonus funds can only be withdrawn after the bonus funds amount has been rolled over 3 times on the exchange. 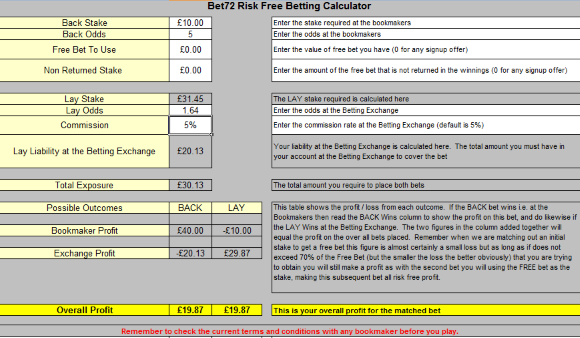 For example, if you are awarded a bonus funds of £25, you must risk £75 on bets on Matchbook. Risk is calculated as the lesser of the stake or the potential win amount, before the funds can be withdrawn. Odds of 6.0 available only to back Arsenal to win. Should Arsenal win all users who qualify for the enhanced odds offer will have winnings increased to reflect 6.0 odds on Arsenal to win. This offer will close once the game kicks off. To be eligible you must back Arsenal to win before kick-off. In-play bets are not eligible. Offer only applies to registered customers from the following countries: Australia, Austria, Denmark, Finland, Germany, Hungary, Ireland, Japan, Netherlands, Slovenia, Sweden, Switzerland, United Kingdom. Funds must be risked on the exchange and cannot be bet against your own account. Similarly, void bets do not qualify for this offer. Offer applies to the Arsenal v. Newcastle match (13/12/2014) only. Users who redeem this offer are not eligible for any other sign up bonus offers. All bonus funds will be credited within 72 hours of the qualifying criteria being met. The promoter of this offer is Triplebet Limited, and players are subject to Matchbook’s general Terms and Conditions. In the event of any dispute, Triplebet’s decision is final in all matters. Normal KYC rules apply for all accounts. Offer is eligible from 22:00 GMT 11/12/2014 to 17:30 GMT 13/12/2014. Simply place your bet on City at the current back odds. If the bet wins we will top up your odds with bonus funds to the value of 3/1 (4.0). Maximum stake for this offer is £10. Offer applies to pre-game bets only. At the time of typing Man City were 1.53 to lay on Betfair meaning you can lock in a very tasty £15+ guaranteed risk free profit whatever the outcome using the maximum initial £15 stake. Here is our spreadsheet showing the 4.0 back price with Matchbook against the 1.53 lay price on Betfair and the £28.85 profit from just this single bet. This offer is only available to new Matchbook customers who place their first bet on Man City v. Everton (06/12/2014). Man City v. Everton (06/12/2014) at their current price and Matchbook will give you odds of 4.0 within 72 hours if Man City win. Odds of 4.0 available only to back Man City to win. Should Man City win all users who qualify for the enhanced odds offer will have winnings increased to reflect 4.0 odds on Man City to win. This offer will close once the game kicks off. To be eligible you must back Man City to win before kick-off. In-play bets are not eligible. Offer applies to theMan City v. Everton match (06/12/2014) only. Offer is eligible from 22:00 GMT 05/12/2014 to 17:30 GMT 06/12/2014. What’s more with just a very nice low 1% commission on all winnin bets, growing liquidity and the range of their markets too, they are becoming a serious player in the betting exchange arena. Simply place your bet on Man Utd at the current back odds. If the bet wins we will top up your odds with bonus funds to the value of 3/1 (4.0). Maximum stake for this offer is £15. Offer applies to pre-game bets only. At the time of typing Man United were 1.35 to lay on Betfair meaning you can lock in a very tasty £28+ guaranteed risk free profit whatever the outcome using the maximum initial £15 stake. Here is our spreadsheet showing the 4.0 back price with Matchbook against the 1.35 lay price on Betfair and the £28.85 profit from just this single bet. Back Man United (29/11/2014) at their current price and Matchbook will give you odds of 4.0. Maximum stake for this offer is £15. Odds of 4.0 available only to back Man United to win. Should Man United win all users who qualify for the enhanced odds offer will have winnings increased to reflect 4.0 odds on Man United to win. This offer will close once the game kicks off. To be eligible you must back Man United to win before kick off. In Play bets are not eligible. Offer applies to the Man United v Hull match (29/11/2014) only. Offer is eligible from 27/11/2014 to 15:00 GMT 29/11/2014. At the time of typing Over 1.5 Goals is just 1.20 to lay on Betfair meaning you can lock in a very tasty £31+ guaranteed risk free profit whatever the outcome using the maximum initial £10 stake. Here is our spreadsheet showing the 5.0 back price with Matchbook against the 1.20 lay price on Betfair and the £31.30 profit from just this single bet. This offer is only available to new Matchbook customers who place their first bet on Man City v Arsenal over 1.5 goals (18/01/2015). All bonus funds will be credited within 24 hours of the qualifying criteria being met. Bonus funds can only be withdrawn after the bonus funds amount has been rolled over 3 times on the exchange. 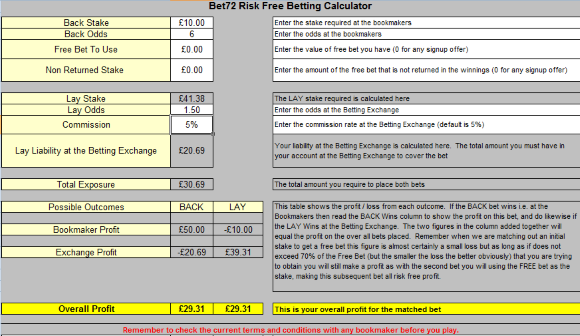 For example, if you are awarded a bonus funds of £25, you must risk £75 on bets on Matchbook. For rollover purposes, risk is calculated as the lesser of the stake or potential win amount. All account withdrawals will be held until bonus funds have met rollover conditions. Odds of 5.0 are only available on over 1.5 goals. Should there be 2 or more goals all users who qualify for the enhanced odds offer will have winnings increased to reflect 5.0 odds on over 1.5 goals. This offer will close once the game kicks off. To be eligible you must back over 1.5 goals before kick-off. In-play bets are not eligible. Offer applies to the Man City v Arsenal match (18/01/2015) only. Offer is eligible from 15:00 GMT 17/01/2015 to 16:00 GMT 18/01/2015. Simply place your bet on Man United at the current back odds. If the bet wins we will top up your odds with bonus funds to the value of 4/1 (5.0). Maximum stake for this offer is £10. Offer applies to pre-game bets only. At the time of typing Man United were 1.64 to lay on Betfair meaning you can lock in a very tasty £19+ guaranteed risk free profit whatever the outcome using the maximum initial £10 stake. 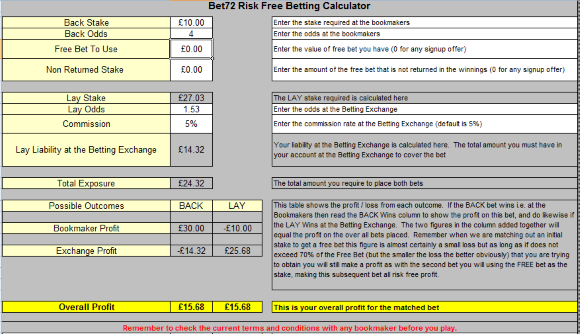 Here is our spreadsheet showing the 5.0 back price with Matchbook against the 1.64 lay price on Betfair and the £19.87 profit from just this single bet. And remember not only are you getting a great sign up offer here but also a 1% betting exchange account to use in the future. So this will allow you to squeeze even more profit from all your other offers too! This offer is only available to new Matchbook customers who place their first bet on Aston Villa v Man United (20/12/2014). Bet on Aston Villa v Man United (20/12/2014) at their current price and Matchbook will give you odds of 5.0 within 72 hours if Man United win. Odds of 5.0 are only available to back Man United to win. Should Man United win all users who qualify for the enhanced odds offer will have winnings increased to reflect 5.0 odds on Man United to win. This offer will close once the game kicks off. To be eligible you must back Man United to win before kick-off. In-play bets are not eligible. Offer applies to the Aston Villa v Man United match (20/12/2014) only. Offer is eligible from 11:00 GMT 19/12/2014 to 15:00 GMT 20/12/2014. To celebrate the start of the NFL season we will have a £50 Risk Free bet offer live at Matchbook where we pride ourselves on offering the best product for US sports in terms of price and liquidity. Place your first bet on Matchbook and if the bet loses we’ll refund the amount to your account upto £/€ 50 to be used as a free bet. Offer applies to new Matchbook customers, who register with the correct promotional code, affiliate code or link. Offer applies to UK + Ireland customers only. Offer applies to bets placed on Pro Football markets only. The maximum free bet that will be awarded is £/€50. awarded a free bet of €50, you must risk €150 on bets on Matchbook. Risk is calculated as the lesser of the stake or the potential win amount, before the funds can be withdrawn. Fantastic and risk free bet of £50 at any odds on anything you like, wow! This is a one day only offer (5/9/13) and remember to click on the banner below to be eligible. 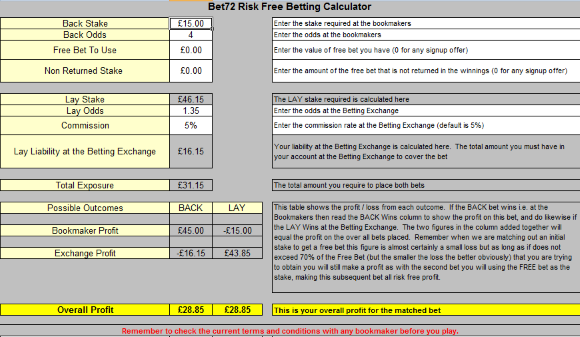 Naturally if the bet loses you will win on the exchange and your free £50 stake returned .